Home / Dogs Howl / Why Do Dogs Howl? Have you ever wondered why some dogs howl? We all know that dogs bark and whine and cry and whimper. These are all perfectly normal ways for a dog to communicate. But you may forget that dogs howl, too. They may not do it very often, but your dog is just as capable of howling as any wolf or coyote. Barking, whining, whimpering and howling are all ways for your dog to communicate and they all signify some particular feeling or desire. We're most familiar with barking and other daily sounds our dogs make. We can identify the way our dog barks to let us know he's hungry or he wants out. We usually know what it means when a puppy whimpers. But it can be quite startling to hear a dog howl. Dogs may howl for several reasons and they are similar to the same reasons that wolves howl. Anyone who has ever heard the haunting, lonely sound of a wolf's howl probably won't soon forget it. A wolf may howl when he's alone to give his position to his packmates. He may howl, in essence, because he's lonely and he wants to be found. Your dog may howl for much the same reason. If you have to leave your dog home alone it's possible that your dog can develop a habit of howling in your absence to express his loneliness. In a way, he's letting others know where he is. His "pack" (that would be you) is missing and he wants to be found, or he wants you to make your way back home to find him. The howl is like a beacon so the two of you can find each other. Of course, your neighbors probably won't appreciate your dog's howling. The howl of a dog can carry for long distances so, for both wolves and dogs, howling is very useful when the animals are separated. 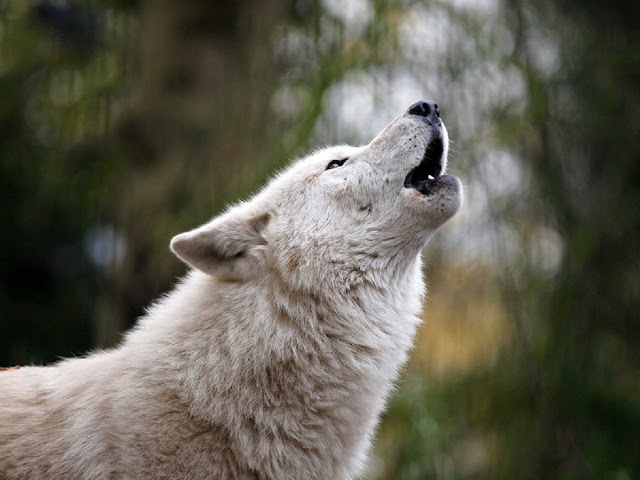 Howling can be a way for the animals to try to re-establish contact with each other. Fortunately, most dogs don't howl this way very often, or for long periods of time. They may bark anxiously, or bark for pleasure or as a nuisance, but howling itself isn't that common among domesticated dogs. There are exceptions, of course. Some hounds enjoy a good baying session. Baying is somewhat different than howling since it usually has some prey as an object - a squirrel up a tree, for instance - but, again, your neighbors probably won't appreciate the subtle differences. Some dogs may also howl when they hear sirens or music. No one really knows why dogs feel the need to accompany these sounds with their own howl. The answer could be anything from the sound hurting their ears to just wanting to join in. If you have a dog who howls there's probably not much you can do about it. If the howling seems to be related to separation anxiety you can work on ways to reduce your dog's anxiety by consulting with your veterinarian and/or a canine behaviorist. Otherwise, your dog probably won't howl very often. If and when he does you should pay attention and see what triggers the event. It could be something important.